Darkly beautiful, restless visuals and soundscapes within a massive fog of sub bass, Scald Process is a new collaboration between Stormfield (Fausten / Combat Recordings) and various live instrumentalists and vocalists including Luxul, Liam Noonan, Eden Grey, Joe Zeitlin, Marco Donnarumma and Mar Del Corral. Informed equally by Autechre, Basinski and Scorn, the project was borne out of dark rooms and fucked up sounds, pushing the extremes of harmonic noise but with a solid soundsystem discipline, combining string abuse, improvisation and distortion with gigantic subs and abstract technoid beat structures. The project began with Aimee Mullen and Marco Donnarumma in 2014 as Sea of Scald (later shorted to Scald) with tracks featured on Rinse FM and a couple of releases on Section 27 and Loose Lips. 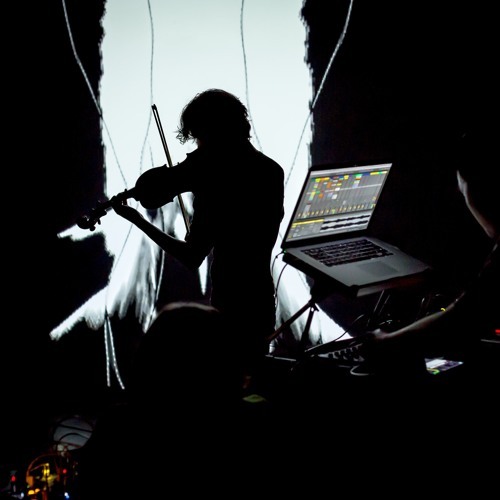 This evolved into Scald Process in autumn 2016, combining a wider range of instruments like viola, violin, piano and vocals with evolving electronic techniques, and quickly snowballed into a load of new material.